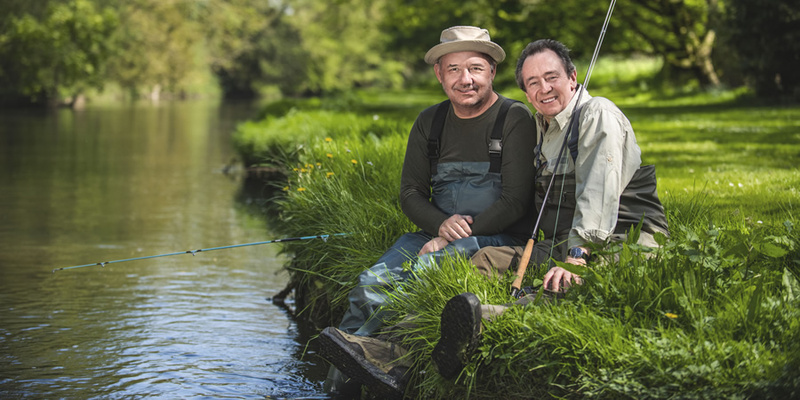 It’s taken me three weeks to write this review because I wanted to give Mortimer and Whitehouse: Gone Fishing a chance to bed in. Three weeks on, I really, really, really want to like it more. The premise is simple, comedians and chums Paul Whitehouse and Bob Mortimer going fishing and chewing the fat…but not literally, this is a totally low fat programme as they have both had heart attacks. The idea of two middle age comedians driving around beautiful countryside basically being themselves is nothing new; Coogan and Brydon did this beautifully in The Trip. Well this is like that but with fishing replacing posh restaurants and chats about their heart conditions replacing impressions of Michael Caine. The heart thing is definitely this shows USP. Bob has had a three-way bypass and Paul has had three stents fitted, so they need to take life easier. Paul thinks that standing in a freezing cold river for hours at a time is the answer. Paul teaches Bob to fish and Bob cooks for Paul. So actually, it’s The Trip, meets The Hairy Bikers meets Trust Me I’m A Doctor all filmed like an episode of Detectorists. Actually, it’s not quite so clear and simple when you think about it that way. The thing is I love Paul and Bob and have avidly watched their respective comedy offerings for over 20 years, but this just somehow doesn’t quite gel. As I said at the start, I really, really want to like this more as I like them. Unfortunately, though this all feel a bit staged and awkward (like The Office, ok so it’s actually The Trip, meets The Hairy Bikers meets Trust Me I’m A Doctor all filmed like an episode of Detectorists with the awkwardness of The Office. The word “derivative” now springs to mind). Each episode follows a simple formula, two attempts to fish, a couple of heart healthy meals and a random visit to a brewery (ep 1) and a church (ep 2). Yeah, those scenes were quite painful. Bob and Paul obviously have faith in the venture as it is made by their own production company Owl Power (you can check the details on the Companies House Website, they are both Directors and Bob’s middle name is Renwick. Isn’t the internet a wonderful thing. Especially if you are a stalker). The thing is, I so want this programme to work, I will persist with all 6 episodes. Perhaps that’s the trick, make the viewer want to watch a show not because it is brilliant, but just because you are curious to see if it improves. Hmmm…there not as daft as they look them two.